Rotation resistant ropes are a special category (class) of wire rope designed to resist the tendency to spin or rotate under load. In general these ropes are used as single part lines, or in situations where operating conditions require a rope that will resist cabling in a multipart system. The essential nature of rotation resistant rope designs impose certain limitations on their application and necessitate special handling requirements not encountered with other rope constructions. 1) Single layer-consisting of a single layer of three or four strands. Typically the strands support one another without a core member. 2) Multilayer strand (Multistrand)-consisting of two or more strand layers closed in opposing directions. Torsional forces generated by each layer of the rope counteract one another to minimize rotation. The multistrand classification includes ropes with between eight and twenty outer strands. Table 1 of this manual describes some of the more commonly available rotation resistant multistrand rope classification. In addition to these, a wide variety of special multistrand ropes is available. See (Figure 9). It would be impractical to cover the specific features of each in this manual. Figure 9. Cross sections of rotation resistant rope constructions. In multistrand rotation resistant ropes the crossover points between strand layers are points of high stress concentration. 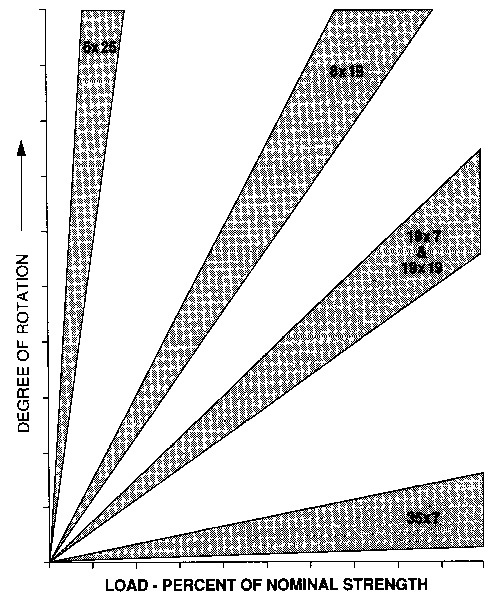 Relative motion of the strands at these points results in accelerated deterioration of the internal components of the rope. Because of this design characteristic of the multistrand construction, care must be taken to avoid high loads with small diameter sheaves. Design factors less than five are not recommended. For assistance in rope selection we recommend contacting our Technical Department to ensure the proper wire rope for your application. Figure 10. Relative rotation with one end allowed to rotate freely. Many rotation resistant ropes are partially preformed. Ends of the rope should be seized tightly, welded or brazed, to prevent lay disturbances of the outer strands or core (two seizings are recommended). Care must be taken to avoid inducing twist into the rope during handling and installation. Follow instructions for removing rope from a reel or coil. See page 26 Figure 19 – 21. Use a pulling grip fitted with a swivel when pulling new rope through the reeving system with a used rope. This practice will prevent residual twist in the pulling rope from being transferred to the new rope. The pulling rope should be the same-lay direction as the new rope. Back tension should be applied to the payoff reel of the new rope to insure a tight even spooling on the drum. Operate the new rope through several complete cycles at light load. This will allow the rope to adjust gradually to operating conditions.